The project was produced in the scope of the “Climate Whirl Project”, a collaboration by the Department of Forest Sciences, the Department of Physics (University of Helsinki) and Capsula. Supported by Kone Foundation and the Research Raft for Art and subjective Science. The Teacup Tools call attention to the investigation of the invisible and borderless air and its aerosols - tiny particles of organic and anorganic matter, with a major impact on cloud formation, crucial to weather and climate. The Teacup Tools are an array of cybernetic teacups, adapting themselves to the realm of climate related sciences. They appear as a multifunctional tool for the investigation of tiny micro clouds above tea, for communication and for tea drinking. On a mobile phone one can log into the local Teacup Tool Wifi and have a look at realtime curves, written by dancing teacups, listen to Data Tango and get more info on the Global Teacup Network. The sculptures have a nomadic quality. Like parasites they can be found next to aerosol measurement stations, in parks, on streets, on roofs or in the neighbourhood of research laboratories. 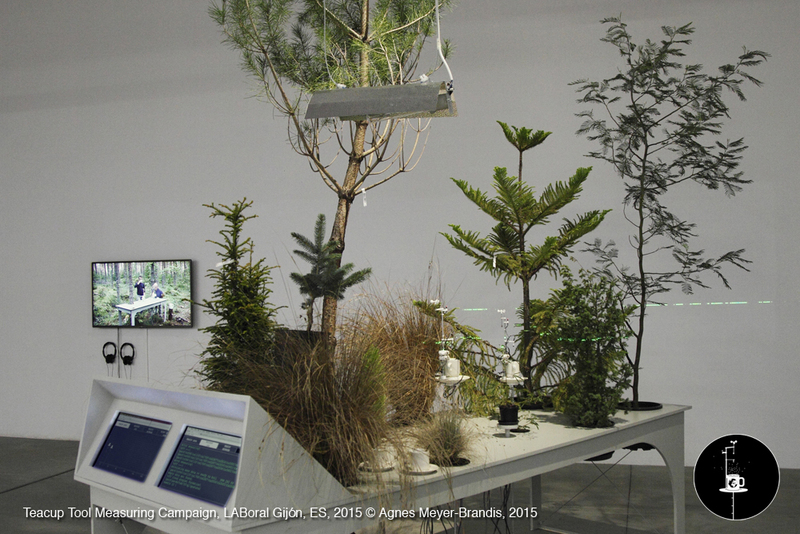 Agnes Meyer-Brandis (DE) is an installation artist, best known for her work Moon Goose Colony. After briefly studying mineralogy, she studied sculpture at the Maastricht Academy of Fine Arts in the Netherlands, studied with Czech photographer and conceptual artist Magdalena Jetelová at the Kunstakademie Düsseldorf in Düsseldorf, Germany, and then earned a master's degree in audio visual media from the Academy of Media Arts Cologne in Cologne, Germany.